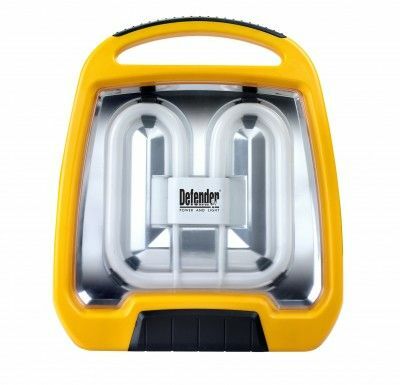 Defender PL 110v Floor Light. A portable, low energy work light that provides a consistently high light output from a 2D 38w fluorescent lamp. Protected by an impact-resistant casing, it delivers maximum output for minimum cost. Features include a tough polycarbonate lens and ABS body, easy-grip handle, high Intensity reflector, rubber anti-shock base. Idea for site, industrial and domestic/DIY tasks.